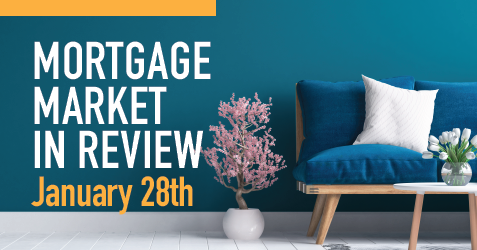 Mortgage bond prices were negative for the week which put some upward pressure on rates. Existing home sales printed at 4.99M units. That data was weaker than the expected 5.25M. The FHFA Housing Price Index showed prices rose 5.8% in the last 12 months. The Housing Price Index (HPI) is a broad measure of the movement of single-family house prices. Leading economic indicators data was weaker than expected. Weekly jobless claims printed at 199K and continuing claims, a summation of all receiving benefits, at 1,713K. Claims were expected at 217K and continuing claims at 1,734K. Weekly claims are at the lowest level in 49 years (1969) and are more proof that the labor market remains tight despite concerns that the economy is slowing. Mortgage interest rates finished the week worse by approximately 1/8 of a discount point. 10:00 am, et 127.5 Important. An indication of consumers’ willingness to spend. Weakness may lead to lower mortgage rates. 8:30 am, et 268K Important. An indication of employment. Weakness may bring lower rates. Up 0.3% Important. A measure of consumers’ ability to spend. Weakness may lead to lower mortgage rates. 8:30 am, et Up 0.4% Very important. A measure of wage inflation. Weakness may lead to lower rates. Payrolls +195K Very important. An increase in unemployment or weakness in payrolls may bring lower rates. 10:00 am, et 55 Important. A measure of manufacturer sentiment. Weakness may lead to lower mortgage rates. 10:00 am, et 91 Important. An indication of consumers’ willingness to spend. Weakness may lead to lower mortgage rates. Economic data is the number one reason mortgage interest rates move on a daily basis. Data is compiled from numerous sources and comes in two flavors, economic growth and inflation. Some releases are more important than others and thus are more likely to cause wider swings in mortgage rates. Rates move in relation to the deviation from expectations. We have significant releases starting mid-week. The potential for mortgage interest rate volatility is greater as a result. Volatility can be the enemy as we saw some last year with continued Fed rate hikes. Signs of economic uncertainty can result in some flight to safety buying of mortgage-backed securities which would be favorable for lower rates. Any indication of strength in the data will likely result in higher mortgage interest rates so remain cautious.